Professional face painters take health, comfort, and safety very seriously. 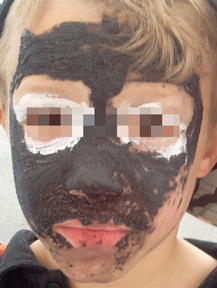 Taken by a colleague in Southern California, this photo shows a child who had a painful experience at the hands of well-meaning amateur face painters. Applied with cheap brushes, the paint was not cosmetic-grade & had been in storage for months from a previous event. A rusty coffee can was used for the water container. The volunteers didn't notice the boy had eczema until he was seen clawing at his face to get the paint off. He suffered because someone wanted to cut costs. By the way, this design was apparently supposed to be "Batman". Don't use cheap face paints, acrylic paints, or sharpies on skin! They have a high rate of allergic reaction and are hard to remove. Daisy Design posted an example for us to use. Whitney Myers of Whitney Myers Event Services in El Paso made the wonderful poster at the top of this page to educate her customers. Thank you, Whitney, for allowing me to use your poster on my site!